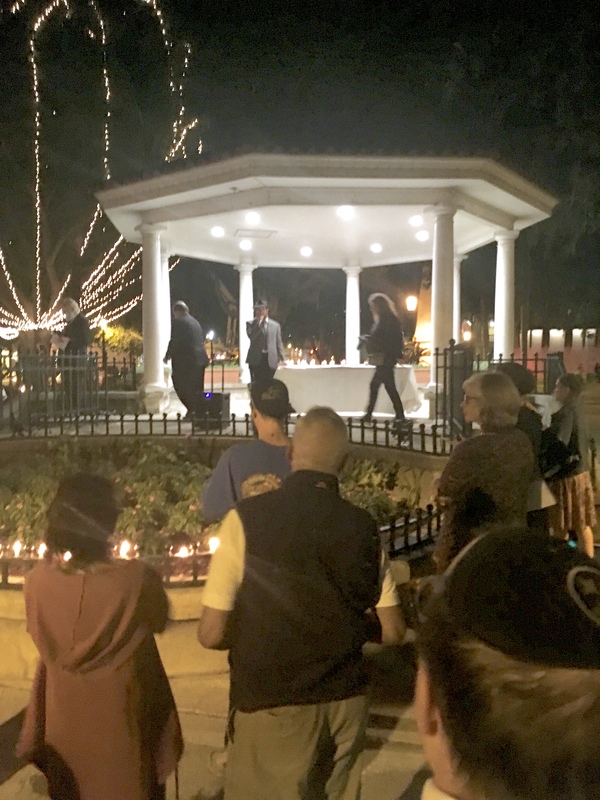 A vigil at the Plaza De La Constitucion in St. Augustine, Florida was held on the evening of October 30th, 2018 in honor of those murdered on the previous Saturday at the Tree of Life Synagogue in Pittsburgh, Pennsylvania. Rabbi Levi Vogel of St. Augustine’s Chabad synagogue officiated. 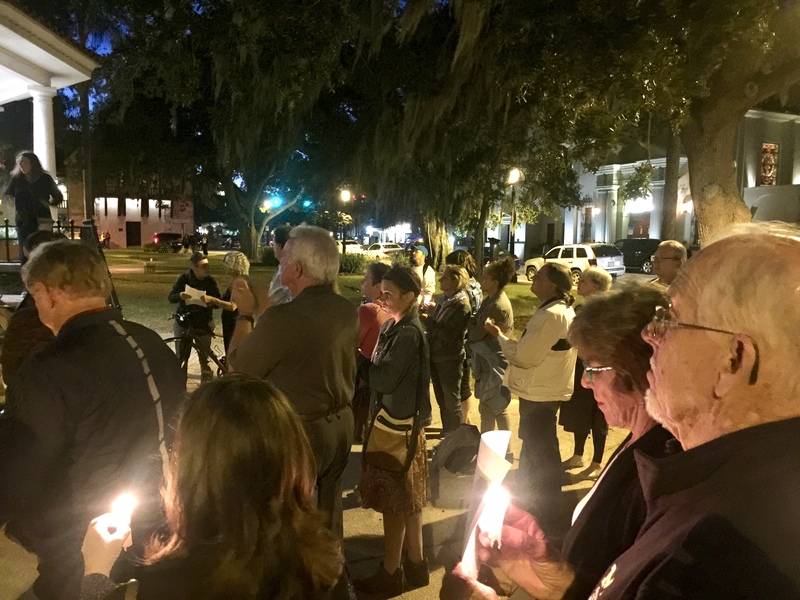 Among those who also spoke were St. Augustine Mayor Nancy Shaver and City Commissioner Nancy Sikes-Kline. The last speaker, whose name I unfortunately was not able to write down, is a member of the Islamic Center of St. Augustine. 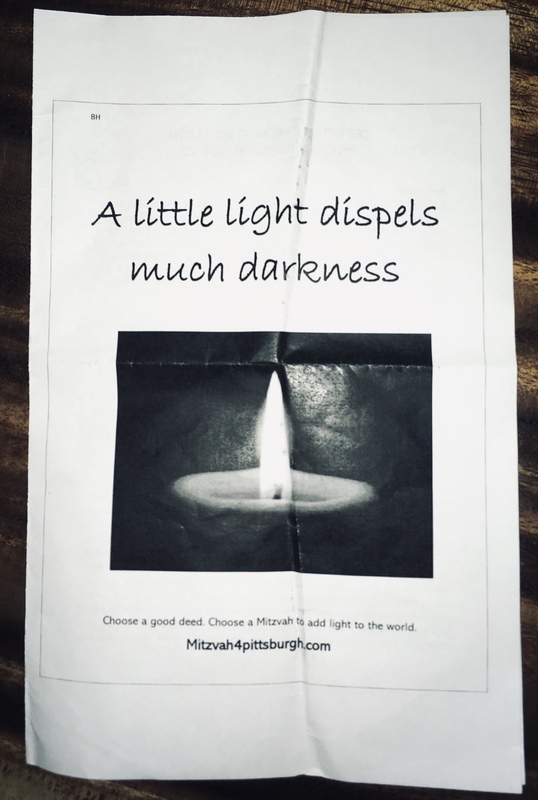 He brought his young daughter with him on the stage, and proceeded to capture the hearts of all in attendance by speaking to the greater need for love, compassion, and understanding of all faiths in the wake of such a tragedy. Rabbi Vogel finished the service by leading the crowd in an English reading of the Mourner’s Kaddish followed by a reciting of it in Hebrew. We were miles away from the families of the victims in Squirrel Hill. But our collective hope for an end to senseless gun violence remains as bright as the yahrzeit candles we lit in their honor. May their murders not be in vain. So incredibly sad. My heart is breaking. I’m not Jewish but I have so many dear friends who are…and their people are my people. As we all are to one another. Thanks, Laurel. I can’t fathom the degree of hate that was the catalyst for this tragedy. Yet, I’m pleased that you attended a vigil for the victims. It won’t bring them back, but it proves that the light of humanity lives on. Slaughtering worshipers while in their house of worship – another act of cowardice that’s becoming all too common here in the free world. 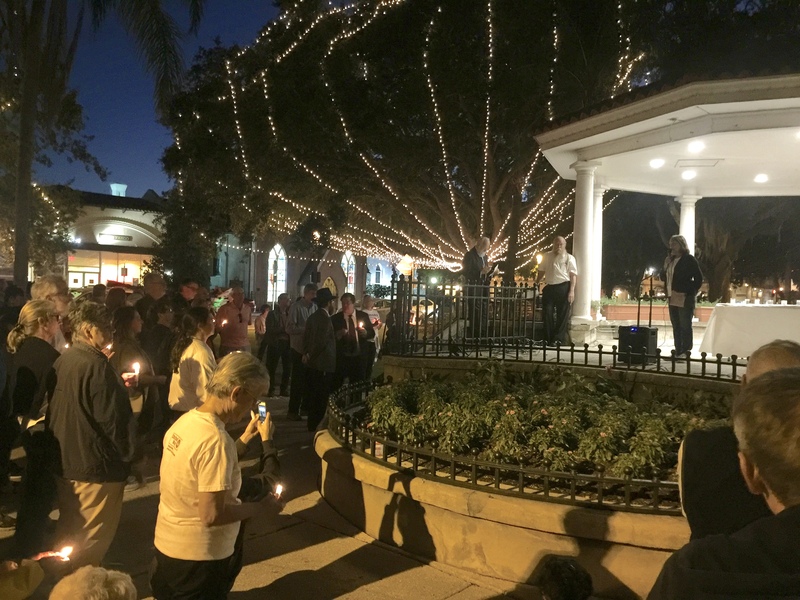 It helps to be a part of a community vigil – for oneself and to show a type of solidarity with those affected. Glad you were there. It counts. Thanks, Laura. No truer words can be said; it does count. The ceremony was both sad and uplifting all at the same time. We truly felt a part of our new community last night. There are no words to express the horror of this and other senseless acts of hate. My thoughts and prayers are with the family and friends of the victims, and with us all. Many thanks for such kind words, Donna. Just when I despair at what we’ve become as a society, I see indications like this that there truly is more good souls than bad. I do wish, though, that I felt that their murders would not be in vain. I’m sad to say that I just don’t believe that anymore. That’s sadly my feeling at the moment too, Janis. But for at least an hour last evening, I was able to feel some solidarity and hope. I don’t know where this intense hatred comes from. People hide behind the mental health issue but there is something that made him pick his targets. These things make no sense and anyone could have been the victim. I think this kind of hate has always been there. But the Internet has certainly allowed for those who think like that to come together in a way that was much more difficult because of time and distance barriers. I used to think the advent of 24 hour cable news was problematic, but this to me is tangentially an outgrowth of it. Thanks for attending and sharing this Marty. If we all give a little, it will make a lot. A lovely post Marty. Many thanks, Moisy. I still cling to the goodness in people even in the darkest of hours. Don’t things like this shooting cause anyone (besides me) to question the very existence of a God? This contemporary version has only been around a few thousand years. Before that, Greek and Roman Gods were thought to be the truth. In 1,000 years it could be some wholly different version of a deity. It’s all so fluid and continent upon social movements. Absolutely they do. My own set of personal beliefs are complicated enough without such tragedies happening, and I find myself even more in doubt when they do. But I suppose I fall back on at least the idea of a “spirit” of some kind of to believe in. Between that and a blanket during those vulnerable moments in the middle of the night, that’s all I got. Many thanks, Joe. It’s awfully kind of you to say that. We were humbled to be in attendance and to participate in a small way. Afterwards we spoke to nearly all of the speakers one-on-one and thanked them for their words. It’s one small community’s acknowledgement of the awful tragedy in another part of the country. Thank you for sharing this vigil at St. Augustine. Just so happened that I visited St. A the weekend before Halloween – a college buddies get-together. We choose St. Augustine because we’d never been there (friends from Alabama, Long Island, Boston and… Pittsburgh). Yes, one of my college friends lives in Pittsburgh and we were all so devastated by the killings. 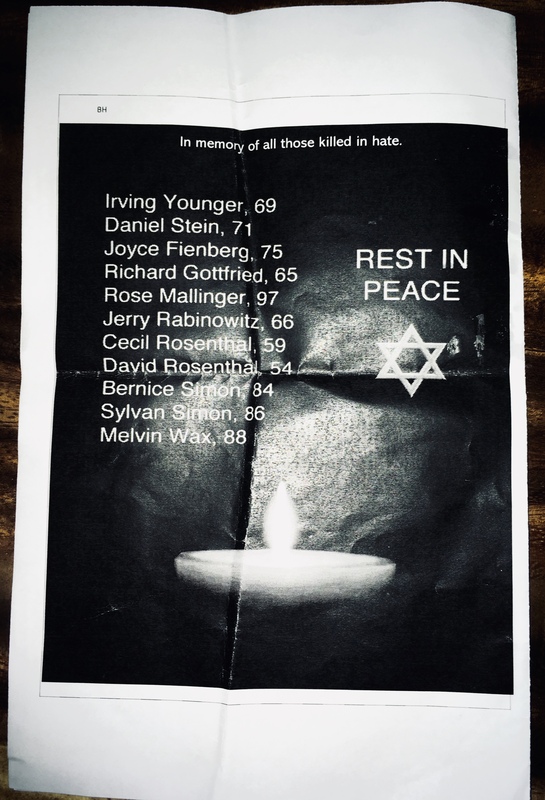 Hate makes no sense – no matter who it’s targeted toward. Hate is Dark. 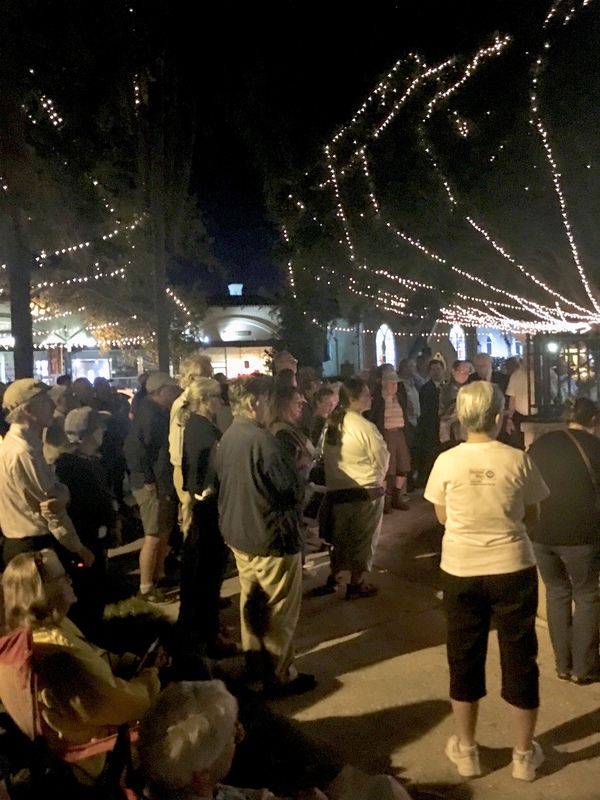 We must spread Light, and that’s what the St. Augustine vigil did. Peace. Namaste.